Happy Spring friends. Things are warming up in Ohio and I couldn’t be any happier about it. Another thing that has me excited is the One Room Challenge. I recently told my husband that I’m going to focus on finishing one room at a time since we have so many small projects going on all around the house. Then, last week I came across the One Room Challenge and this is just the motivation that I needed to stick to my plan. I decided to focus on my laundry room since it’s small. I will have six weeks total to redo it. It’s going to be tough given all of the work travel that I have in April but it’s doable. 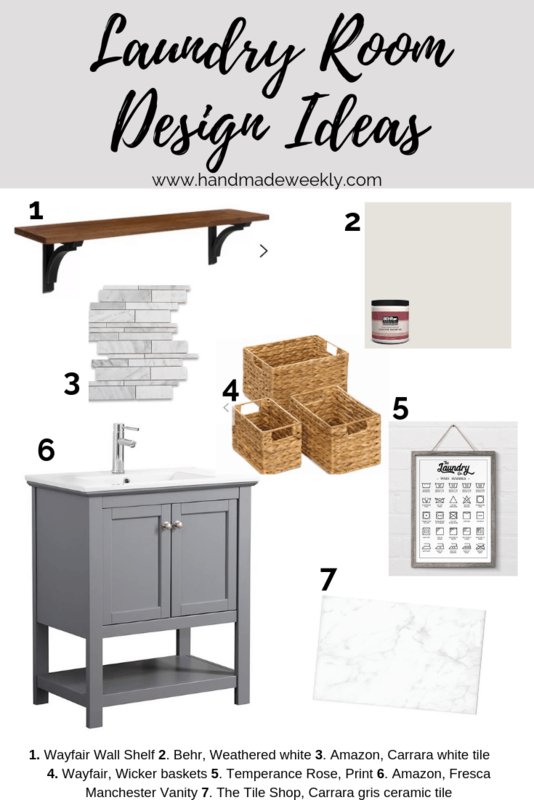 Today is the official start of the challenge so for week one I’m sharing my laundry room design ideas. 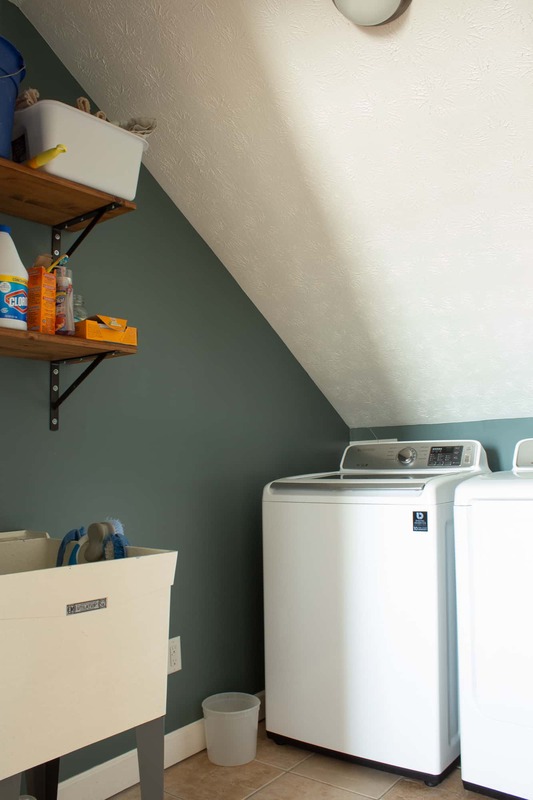 My current laundry room isn’t horrible but it could use a refresh. The pictures below are what it looks like today. It’s VERY small, the floor tile is cracked, there isn’t much storage and the utility sink is covered in paint and stains. To top it off, the slope of the ceiling seriously limits what I can do in here. I can’t change the size of my laundry room but I can brighten it up and make it more inviting. I’ve never shared my design plans ahead of time before. I think this is because I’m a bargain shopper so I tend to vary from my original plans to lower the cost of my projects. This is my warning to take my design ideas with a grain of salt. There is a high likelihood that some of it will change at least a little bit. There are a few items that are set in stone for this project. These are items that I either already have on hand or purchased this week. I bought a gallon of Behr Weathered White Paint from Home Depot today so there is no turning back now. With the awkward slope of the ceiling I’m excited to have less contrast between the walls and the ceiling. I think it’ll make the room seem larger and definitely brighten it up. I ordered a Drop in utility sink today. I don’t love the look of the freestanding utility sinks like the one that I already have. My plan is to either build a cabinet for the drop in sink or modify a cabinet that I purchase. I haven’t quite settled on the design or color of the cabinet but I’ll be sure to share free plans when I get to that step. What I do know is that I need more closed storage in my laundry room and base cabinet will solve my problem. Before I even thought about buying floor tile I took inventory of my previous project leftovers that I store in my basement. Did I mention that my laundry room is tiny? Well, the one benefit of having a tiny room is that you don’t need much flooring. I had plenty of tile left over from my master bathroom remodel so this should save me quite a bit. I’m going to keep the wood wall shelves that you see in my original picture. I built these a few years ago and they work well. With the slope of the ceiling above my sink there isn’t enough room for a closed cabinet so open shelves are a good alternative. 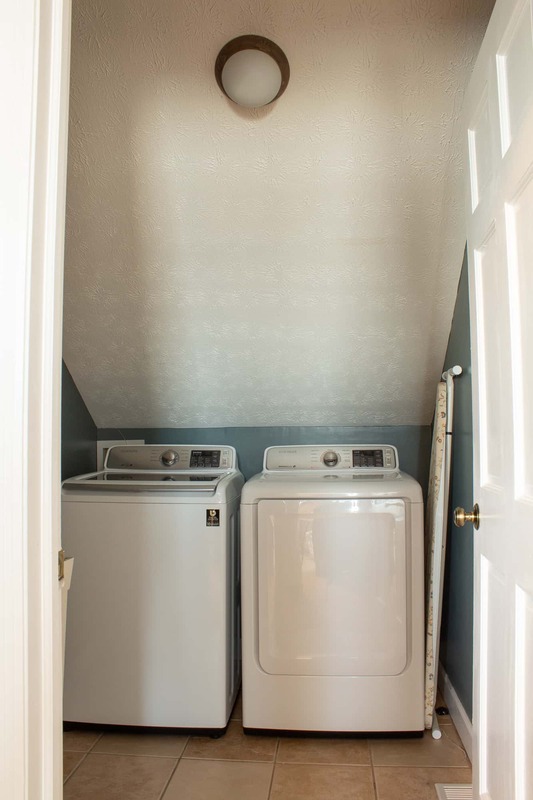 If I push my washer and dryer up against the left and right walls I have a little over 13″ in between them. I’m thinking about building a wood tower with sections that I can store baskets in. I’ll need to find the right baskets to design this around. 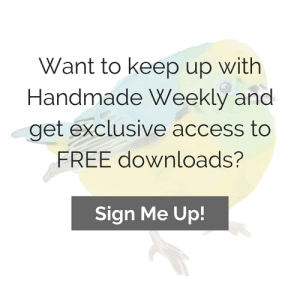 I’ll share free woodworking plans if I go this route. Right now my ironing board rests against the wall but I’d like to get it off the floor. I plan on designing an ironing board and iron holder that I can hang from the wall in between the utility sink and the washer. While I don’t have the design pinned down, I know for certain that I’ll be doing this so I’ll share the plans when I’m finished. You can visit the One Room Challenge blog to see room transformations from several bloggers. They have featured and guest participants. I can’t wait to see how everyone’s plans turn out. Thanks so much for stopping by. I’ll be posting my progress each Thursday for the next five weeks with the final reveal posted on Thursday May 9th.